I was reading this post about titles over at The Painter's Keys. "What are your thoughts on changing the names of artwork to fit a venue, exhibit, or buyer? For example, is it okay to modify my often generic titles to more specific places, particularly when sending things off to shows? Is this wrong or deceitful? And, if changed, should new titles stay that way?" In my opinion, if you need to change the title, then you just didn't get it right in the first place! Of course, this doesn't apply to 'working titles', which are merely placeholders until you have a proper title but I think that there is a point at which the title is set in stone. For a book, this is when it goes to the printers or when the advance publicity goes out. For a work of art, it's usually when the work is exhibited. There are exceptions, of course. If you're constantly remaking a piece in different places, then altering the title for each remake can be an appropriate way to differentiate them. Antony Gormley does this with his well known piece, The Field but they all still contain the word 'field' in the title. Repeatedly changing a title could conceivably also be an important conceptual part of a work - for example, if your actual subject matter is the way that perceptions of the art change depending on how the work is 'framed' by the title. But I see a big difference between both these examples and changing the title just to suit other people or to try and score a sale. I know that titles aren't important to all artists but for me, they're a vital part of the work. I don't consider a piece properly finished until it has a title and I think about them a lot. I keep lists of possible words or phrases in my sketchbooks and often find scraps of paper scattered randomly around the house with prospective titles written on them. The only time I've ever changed a title is when the title I've given it didn't 'stick' for some reason. For example, this piece was originally called Do More With Less. 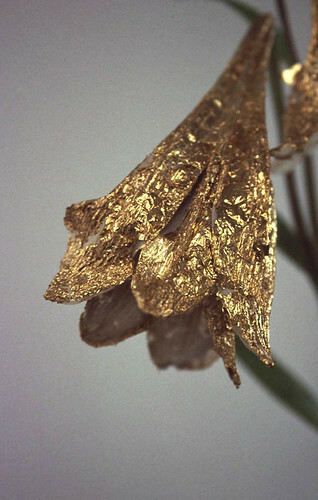 The whole piece was my sarcastic riposte to my college tutor telling me to 'do more with less' - because naturally, when accused of 'gilding the lily' my response was to do exactly that! But the original title was clunky and I could never remember exactly how it went, so it was discarded in favour of the more prosaic Gilded Lilies. 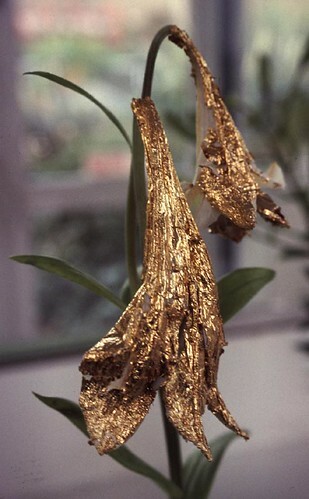 And in retrospect, I can see that the more fanciful title was, er... gilding the lily. I've also accidentally named things twice when I've forgotten that I'd already titled a work. When this happens, it's obvious to me that the original title wasn't quite right or I would have remembered it. When I name my work, I'm trying to find a title that so precisely and elegantly captures the essence of the piece that a name change would be utterly inconceivable. I try never to change a name once the piece has been formally exhibited (although I couldn't swear that this has never happened). Changing a title in order to make the work more palatable (something I've been asked to do only once) or simply in order to try and sell the work, makes me very uncomfortable. Certainly, I think that changing titles multiple times simply in order to suit the audience, venue or exhibition is confusing and dubious: the work needs to have integrity. So what do you think? Is titling important to you? Would you re-title a work in order to sell it? Posted in Blog. Tags: Art thoughts, My Art on July 15, 2009 by Kirsty. Interesting topic. Names have always been of great interest to me, what they say and what they mean, and the act of naming is something I've always approached with reflection and care. An attitude which carries over when titling work. At this stage for me, once chosen, if a title fits, it belongs and is a part of a piece I could not imagine discarding lightly. Clearly we are of one mind on this, Denise. I've always been fascinated by word meanings and where words come from, which is partly why titles matter to me. I also think that titles give viewers a stepping stone into the work. Maybe they're less important if the artist is working in a realistic style but I think that a lot of contemporary work is enhanced by a little nudge in the right direction.